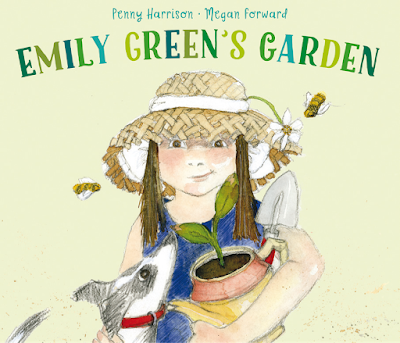 Emily Green’s Garden is a breath of fresh air, a book which represents the creative and nurturing minds of many young children. Emily lives with her family on a busy street. Everything and everyone around her is on-the-go, from the hustle bustle outside to household chores. While lovely it’s also constant and consistent, until one day a flicker of green catches Emily’s eye. Inspired by a tiny seedling, Emily researches plants, gets messy and creates a magnificent, uplifting world of green around her, even in the kitchen cups! Will Emily’s new world take over her whole house? A heartwarming message about sharing beauty prevails. Wonderfully presented with thick quality pages and a spot varnished cover. The soft loose watercolour and pencil illustrations suit the text perfectly. I love the visual details such as wiggly worms crawling out of a colander and seeing what Emily’s dog is up to in many scenes. A lovely story to read with children, especially little gardeners and those close to nature. For more beautifully worded stories written by Penny Harrison see The Art Garden and Dance with Me. Also, see A Patch from Scratch illustrated by Megan Forward.